I’m so happy with this chemisette! I had sized up a chemisette pattern from Janet Arnold years ago, but it didn’t fit me as is, so for this I used the pattern for a pelisse I’m working on as a starting point for fit and the Janet Arnold pattern as a reference for grain lines and overall shape. The fabric is ‘silky cotton voile’ from Dharma Trading. I used it for Annabelle, one of my mid-19th century dresses and had the perfect long straight scraps left for cutting out a chemisette! The weight of the fabric is lovely and so comfortable to wear and it’s nice and sheer just like a chemisette should be. Plus, it behaved so well, finger pressing as I did the seams and the pleats on the two collar layers. The chemisette uses a combination of running, whip, and slip stitches for the seams and narrow hems. 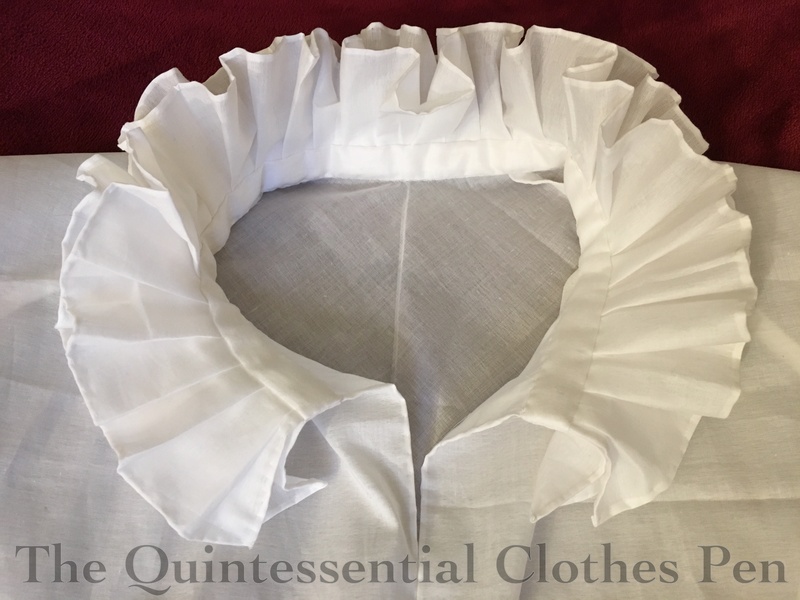 It ties below the bust using a 1/4″ cotton twill tape. I thought of putting a closure at the neck, but decided against it as there are images of chemisettes being worn open at the neck (like this) and I really like that look on me rather than the head-on-a-platter look of it closed (see a mix of styles including that here). If I had closures but decided to wear the chemisette open at the neck you would see them and I don’t love that idea. 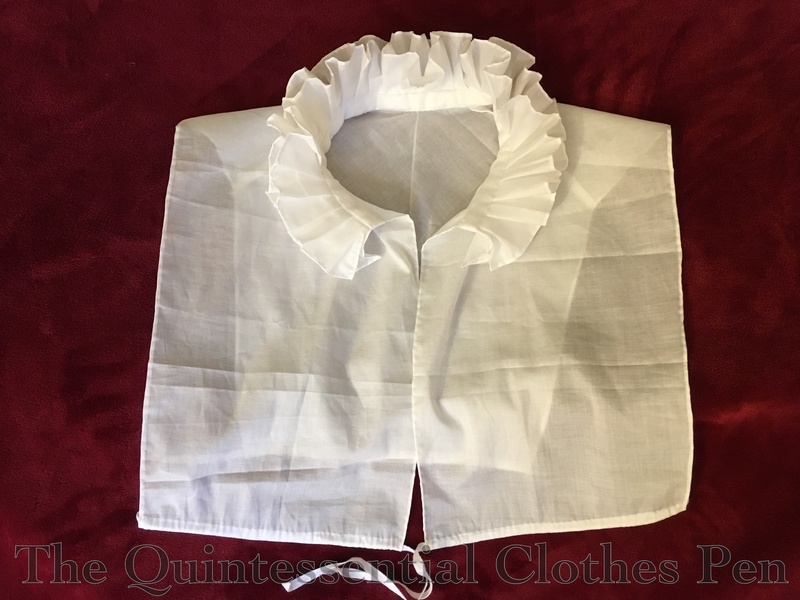 March’s HSM challenge is The Great Outdoors and I’m calling this chemisette a fit for the challenge, as I intend to wear it with a pelisse for an outdoor promenade. Plus, chemisettes are useful for protecting the skin from the sun (which of course you are so much more likely to be exposed to while outdoors!). So, here are just the facts. Fabric: Leftover bits of silky cotton voile from another project. Pattern: Based off of my own, but referencing those in Janet Arnold. Notions: Thread and 1/4″ cotton twill tape. How historically accurate is it? : I’m going to go with 100% on this one. The materials are good and so is the method. Hours to complete: I didn’t pay attention because I was leisurely sewing this while on vacation. Maybe 8-10? First worn: Will be worn in April. Total cost: All from the stash! Free! 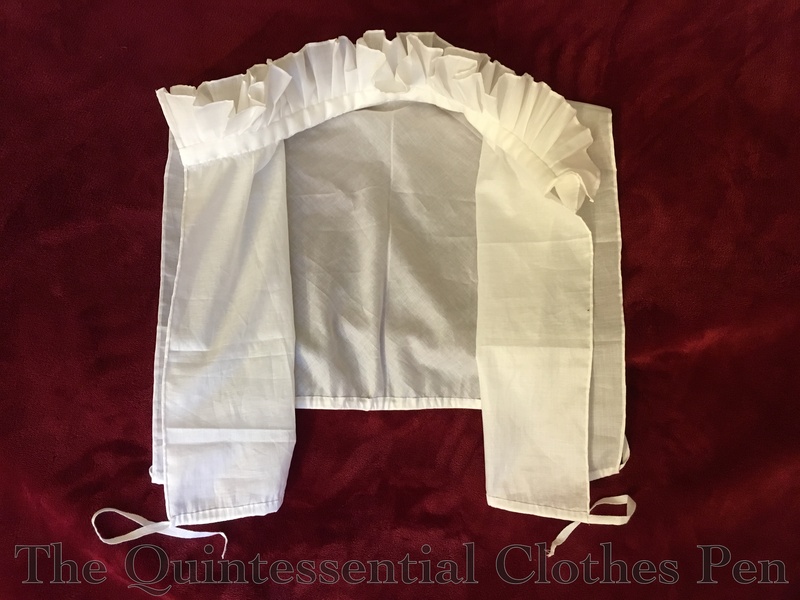 This entry was posted in 1800s, 1810s, 19th Century, Accessories, Costume Construction, Hand Sewn Elements, Historical Sew Fortnightly, Regency Clothing and tagged 1800s, 1810s, 19th Century, Accessories, Chemisette, Clothing, Cotton, Historic Clothing, Regency, Women's Clothing. Bookmark the permalink. Hooray! This came out so well. I can’t wait to see the whole ensemble! I lucked out and found a sleeveless blouse on the clearance rack almost identical to your chemisette, with the exception that it is a full blouse. It’s great for contemporary or historical wear. Love your blog – thanks so much! This is so pretty! I’m excited to see pictures of the regency weekend! Thanks! I hope to have good pictures. We’ve got a great turnout this year!